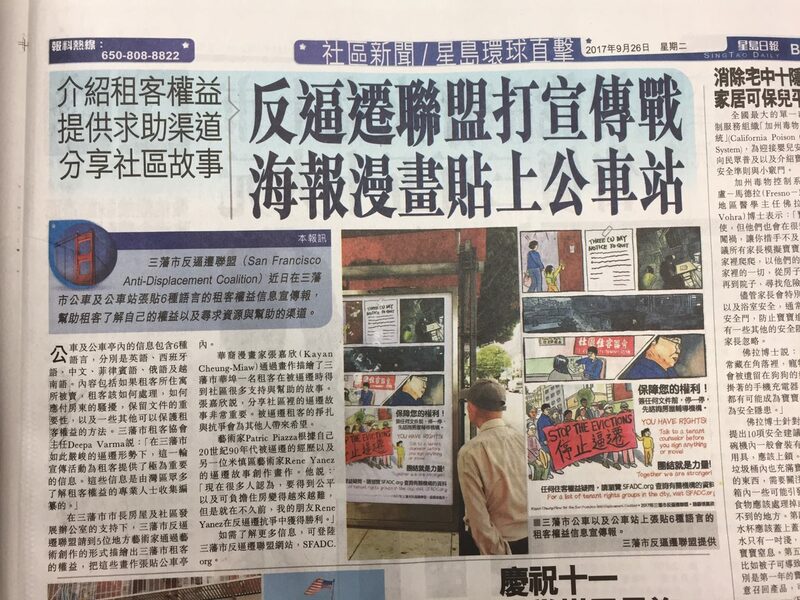 Mission Local and Sing Tao both published articles highlighting the SFA DC’s roll-out of Know-Your Rights ads on city buses and bus shelters across San Francisco. Buses and bus shelters feature tenant rights information in the city’s five major languages. A wide range of tenant rights groups collaborated to create the campaign, as well as a set of informational guides and a centralized list of tenant rights counseling groups for all San Francisco tenants. The powerful images can also be downloaded and shared freely at SFADC.org/pdfs. For more information, see our previous post: Tenant Rights Campaign Released on City Buses.